I should point out now that you aren’t required to use the exact brands I used to create the drawing. 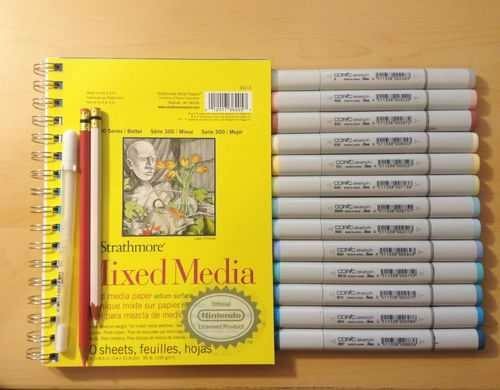 I used these materials because they’re what I’m most accustomed to.The techniques I demonstrate can be done with whatever markers and paper you’re comfortable using. What matters is that you understand the technique because when you do you can apply it to anything. 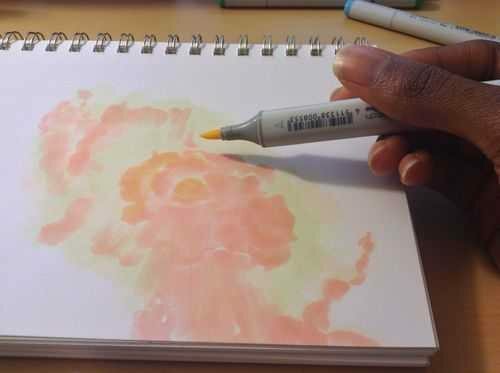 I begin by making some abstract cloud-like shapes with E50 (Eggshell), which is a very faint yellow. 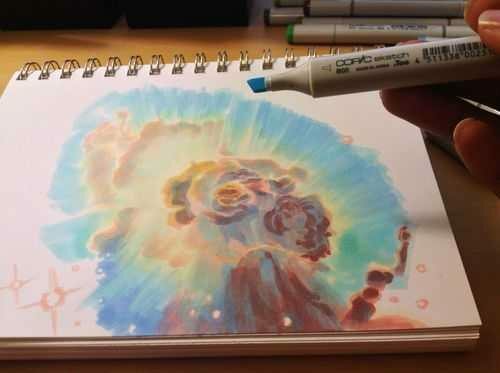 There’s no pencil sketch here because space nebula (as well as atmospheres and natural landscapes) can be easily created by layering abstract shapes on top of each other. Using Y21 (Buttercup Yellow) and G20 (Wax White) I basically repeat the first step. Still working very light. I realized after the fact that Buttercup Yellow was a bit too intense for this drawing so I stopped using it there. This is why it’s important to have a sheet of scratch paper nearby to test out colors before you apply them. Because once they’re down, they’re DOWN. Next I use R20 (Blush) to start defining the shapes of the gases in the nebula. Then I go back to Eggshell. 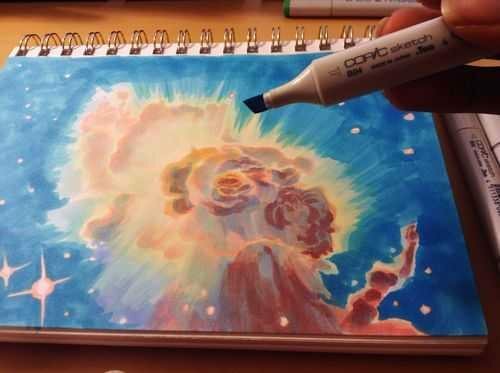 It’s probably hard to see what I did here, but I used the brush tip end (on its side) to swipe inward, from all sides, towards the center of the nebula. The reason being is that the brush tip is more saturated than the chisel tip. 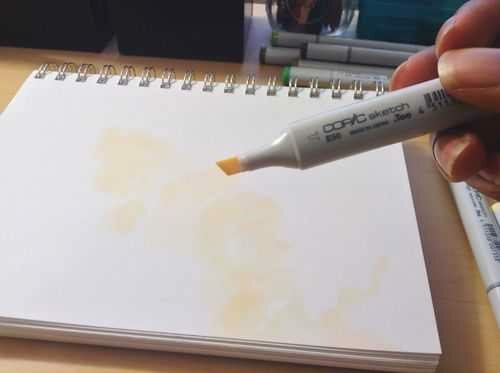 This helps intensify the lighter shade of yellow that’s already on the paper. 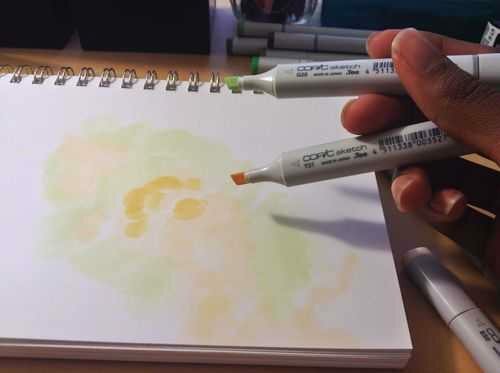 If also makes crossfading colors easier because the sideways swipe motion creates a soft gradient that tapers towards the edge. 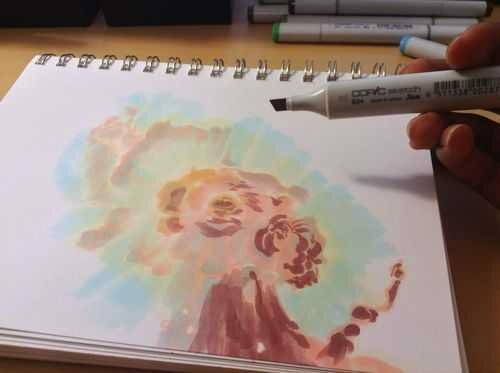 I’ll use this technique multiple times throughout the drawing..
Now with B000 (Pale Porcelain Blue) I layer over the gases in the center while working my way outwards. Again I’m pulling my strokes inward because I know the surrounding space will be deep blue and I want the transition to be a smooth one. With E04 (Lipstick Natural) I’m finally beginning to put in some of the darker colors. At this point the drawing sill looks like a random mess. Sometimes you’ll get the urge to rush and make the drawing look like something, but you have to be patient and take your time. Using B32 (Pale Blue) and R20 again, I’m going around the nebula detailing and adding layers of color. 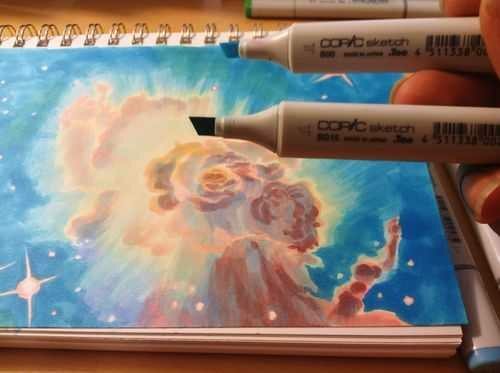 I’m also leaving some white spaces which will later become stars. My Pale Blue is actually beginning to dry out, but here in able to make that work to my advantage because it streaks from the chisel end create a dry brush effect which helps add to the glow. 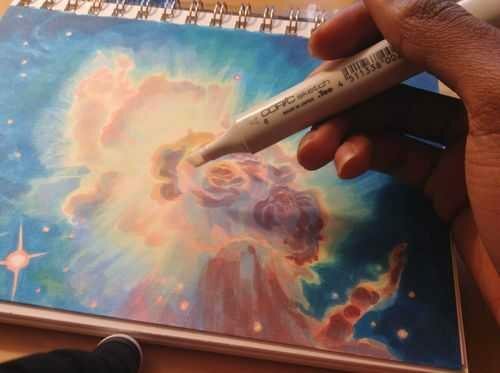 The nebula portion of the drawing is beginning to take shape. Working my way around the perimeter with Pale Blue. From here you can see the importance of working light to dark. 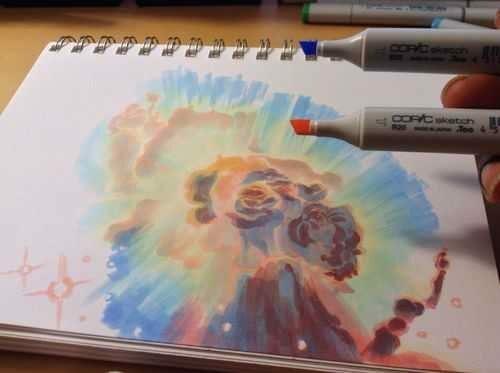 Build your colors gradually and avoid the urge to go too dark too early. You want to have room for error and you don’t want create more work for yourself. With B04 (Tahitian Blue) I fill the surrounding space completely. I’m not too concerned with trying to get an even layer because I know that I’m going to add darker shades of blue next. Here I used B00 (Frost Blue) to start cleaning up some of the edges around the nebula. I also used BG15 (Aqua) to add some pockets of color in the surrounding space. Adding darker layers to surrounding space with B14 (Light Blue), which surprisingly a pretty dark shade of blue. Then I used B97 (Night Blue) to add the last layer, which is the darkest layer in this drawing. Now it’s time for the final details. 0 is the Colorless Blender. But it’s not necessarily used to blend. 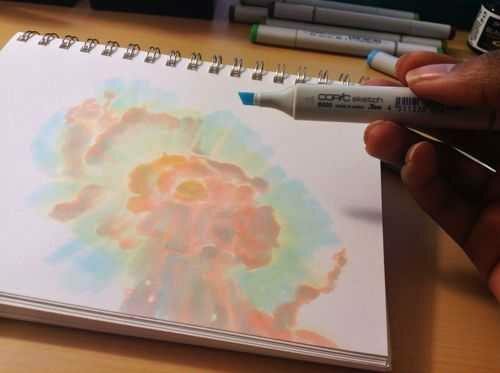 Instead it almost acts like an eraser because the ink pushes colors away when you put it down. Because of this I generally don’t use it. But it works great for things like water, landscapes and atmospheres. 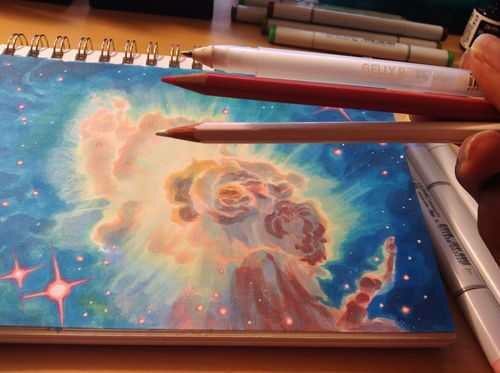 Or in this case, space in which I used it to pull out highlights in and around the nebula. The colorless blender is odd, but it occasionally has its uses. This is the final step and my personal favorite. Highlights and small details. 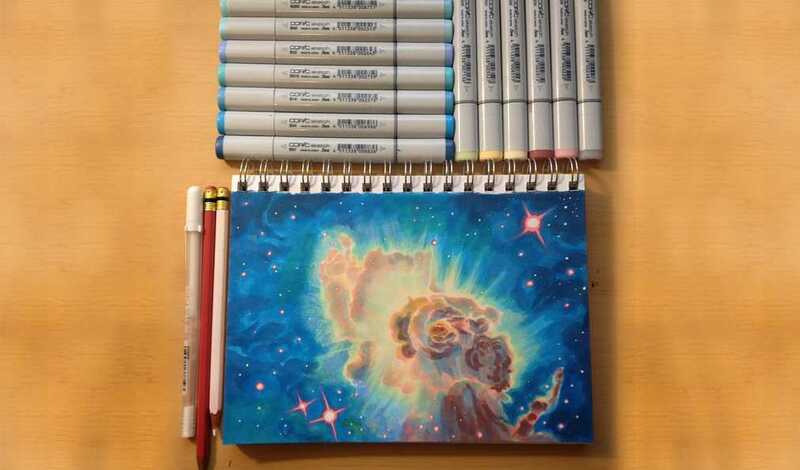 I used the pink and white pencils to color around the edges of the brightest stars to make them look as if they’re glowing. 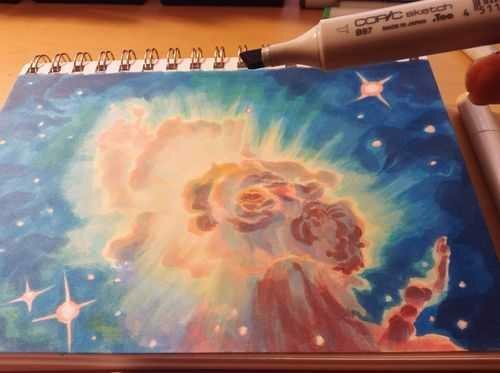 Then I used the a white gel pen to color inside those stars to make them shine and pop off the page. And here’s the finished drawing. This was hastily put together, but hope y’all found this to be informative and easy to follow. I’ll try to do more marker walkthroughs on different subjects in the future. Until then thanks for all your support and encouragement! What do you think? Let me know in the comments! My name is Nuri Durr. The internet knows me as ActionHankBeard. 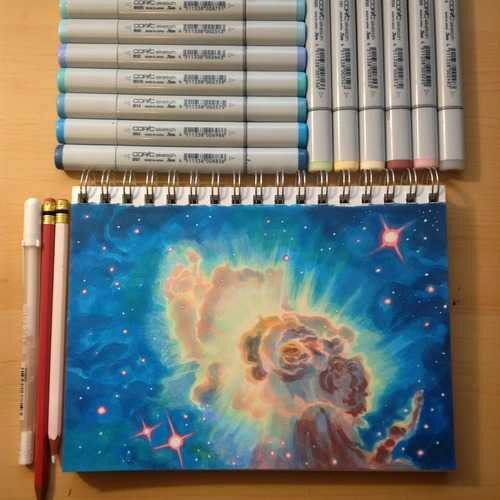 I'm a young illustrator living in Atlanta that enjoys working with traditional mediums, particularly Copic and Prisma markers.